We spend most of our waking lives at work–in occupations often chosen by our unthinking younger selves. And yet we rarely ask ourselves how we got there or what our occupations mean to us. The Pleasures and Sorrows of Work is an exploration of the joys and perils of the modern workplace, beautifully evoking what other people wake up to do each day–and night–to make the frenzied contemporary world function. With a philosophical eye and his signature combination of wit and wisdom, Alain de Botton leads us on a journey around a deliberately eclectic range of occupations, from rocket science to biscuit manufacture, accountancy to art–in search of what make jobs either fulfilling or soul-destroying. Along the way he tries to answer some of the most urgent questions we can ask about work: Why do we do it? What makes it pleasurable? What is its meaning? And why do we daily exhaust not only ourselves but also the planet? Characteristically lucid, witty and inventive, Alain de Botton’s “song for occupations” is a celebration and exploration of an aspect of life which is all too often ignored and a book that shines a revealing light on the essential meaning of work in our lives. ALAIN DE BOTTON is the author of three works of fiction and six works of nonfiction, including "How Proust Can Change Your Life, The Consolations of Philosophy," and "The Art of Travel." He lives in London, where he founded The School of Life. "Exquisitely written - and enhanced by Richard Baker's photos - the book is at once a richly detailed account of tuna fishing, cookie-making, career counseling, and accountancy, and a perceptive philosophical meditation on work, with 'its extraordinary claim' to provide, along with love, the principal source of meaning in our lives." "The best introduction to architecture I have ever seen . 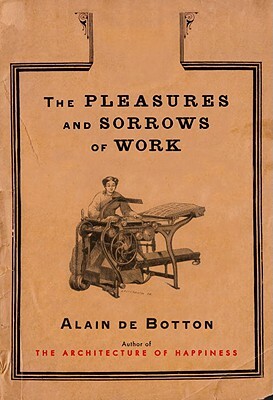 . . [De Botton] writes with an engaging freshness . . . I can't recommend this book too highly. It gets just about everything right." "A perceptive, thoughtful, original and richly illustrated exercise in the dramatic personification of buildings of all sorts." "With originality, verve and wit, de Botton explains how we find reflections of our own values in the edifices we make . . . . Altogether satisfying." "An interesting and important addition to the debate over the emotional effect that our cities and buildings have on us . . . . The Architecture of Happiness rightly tell us to trust our senses and personal experience." "An elegant book . . . . Unusual [and] full of big ideas . . . Seldom has there been a more sensitive marriage of words and images."